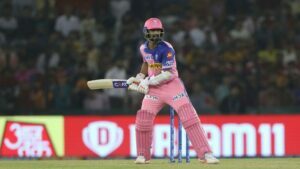 Ajinkya Rahane is struggling both as captain and batsman in the ongoing Indian Premier League season and things just got from bad to worse for the Rajasthan Royals on Tuesday night as they suffered a 12-run loss against Kings XI Punjab in Mohali. Rajasthan Royals are languishing in seventh place with just two wins from 8 matches so far and are just ahead of Royal Challengers Bangalore, who have recorded one win so far. Ajinkya Rahane’s poor form with the bat has contributed to Rajasthan’s string of losses this season with their captain having scored just 201 runs from 8 matches so far at 25.12 with one half-century. Rahane is no longer considered for selection in India’s limited-overs teams due to his inconsistent run in the shorter formats. He last played an ODI for Indian in February last year and was not even considered for selection in India’s World Cup squad earlier this month. Even in Test cricket, India’s vice-captain has been far from impressive in the last two years, averaging just over 24 and 37 in 2018 and 2019, respectively. Former India cricketer Sanjay Manjrekar believes that Rahane needs to accept the mistakes that he is making as a batsman and only then can he start improving on his game. Have felt this for a while now, Ajinkya Rahane is living in denial about his batting form. Once he accepts that there is a problem with his batting, then only can the repair work begin Manjrekar tweeted after Rajasthan’s sixth loss in IPL 2019 on Tuesday night. For the first time this season, Rahane demoted himself in the batting order and came out at No.4 but struggled from the onset as the Royals chased a challenging target of 182 at the IS Bindra stadium. Rahane scored 26 off 21 balls and failed to lead from the front once again as Kings XI won easily at the end, restricting the Royals to 170 for 7 in 20 overs.